Thanks to Vodafone, the Taurus-Littrow Valley will get its first mobile phone base station next year. It hasn't needed one up to now, as the last visitors drove through in 1972, the year before the mobile phone was invented. Next year, though, it will get the very latest in 4G LTE coverage, when it receives a visit from two very special self-driving vehicles. Taurus-Littrow is the landing site of Apollo 17, where humans last walked on the moon. Next year, an international group based in Berlin plans to send a mission carrying two lunar rovers to explore the site. 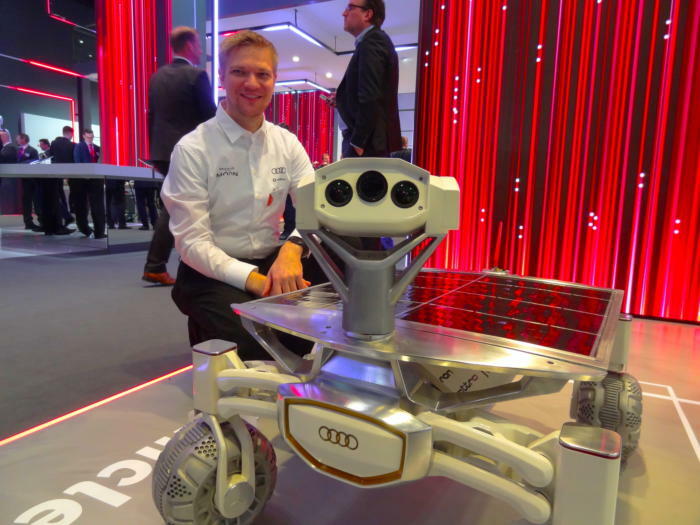 The group, Part Time Scientists, has been working on the project for longer than eight years and already has sponsorship and support from auto manufacturer Audi to develop the rovers. Karsten Becker of Part Time Scientists shows off a lunar rover like the ones the organization will send to the moon in 2018. Its mission will spend about 10.5 days on the moon's surface, where temperatures during the lunar day (which lasts about two earth weeks) can hit 120 C, while during the lunar night they can plunge to minus 180 C.
"That's quite a challenge for the electronics, so there is a chance it will not survive the first lunar night," said Karsten Becker, head of the PTS embedded electronics development team. NASA has asked private space missions to touch down at least 2 kilometers from Apollo sites so that they are not covered by dust kicked up during the landing. That distance presents a challenge for PTS because it will not have line-of-site communications between its landing module and the Apollo 17 site in the bottom of the valley. To help deal with that, PTS has found a new sponsor, mobile network operator Vodafone. 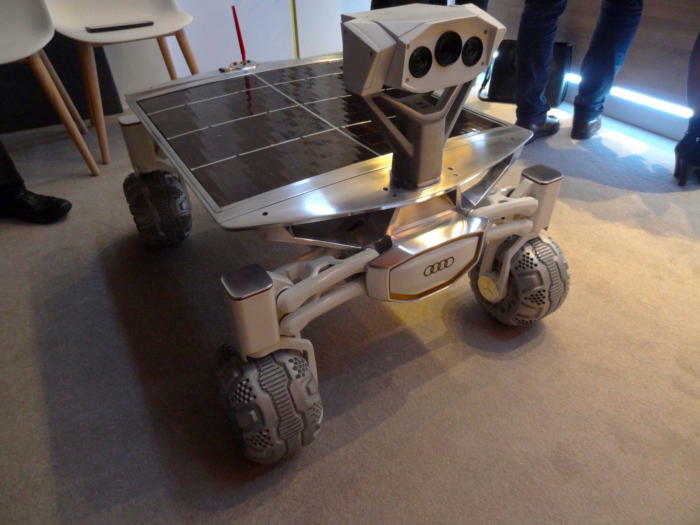 At the Cebit trade show in Hanover, Germany, Vodafone executives described the communications systems the PTS rovers will use to communicate with the landing module and with one another. The systems will be based on LTE and C-V2X, a planned extension to LTE that smart cars can use to communicate with one another and with their surroundings, said Vodafone's head of machine-to-machine communications for Central Europe, Marc Sauter. C-V2X, when it becomes part of the LTE standard, will allow vehicles to exchange live data from sensors and cameras without having to go through the network infrastructure, so they can share information about road conditions and traffic with their neighbors with much lower latency. Latency and heavy traffic won't be a problem in the Taurus-Littrow Valley, but the lack of network infrastructure will. With the vehicle-to-vehicle variant of LTE, though, one rover on higher ground will be able to act as a temporary base station, relaying data between the lander and the other rover down in a dip, Sauter said. 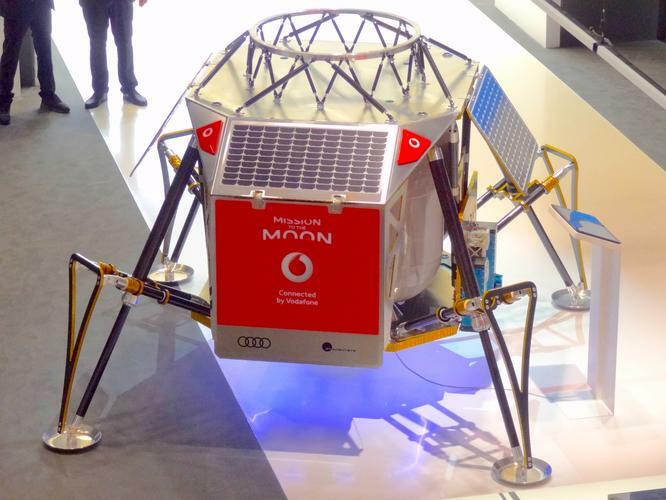 Vodafone's stand at Cebit 2017 included a lunar rover like the ones Part Time Scientists will send to the moon in 2018. Once the data reaches the lander, it can use the European Space Agency's satellite communication network to send the data back to the control center on earth. Another reason for using the C-V2X modules is that they are power-efficient, given the limited energy resources the rovers will have on the moon, he said. For now, Vodafone has just four of the necessary C-V2X LTE modules, and they're all in Hanover for another demonstration. By the time PTS is ready to launch three into space, though, manufacturer Huawei Technologies should have delivered more. Vodafone won't say how much its support for the mission is worth. Becker put the cost of its first mission to the moon at around €50 million (US$54 million) but said subsequent missions would be cheaper. PTS has financial support from Audi, Vodafone, and a third, yet-to-be-named sponsor, and the group is also covering its costs by running experiments for other organizations. Becker mentioned two of them: one to accurately measure the moon's gravity, which is around one-sixth that on earth and another to study how plants grow in that reduced gravity. To keep costs down, PTS has asked Space Flight Services to find it a shared flight riding on top of a geostationary satellite. "It's very likely to be on a Space X Falcon 9," Becker said. If so, then PTS just has to hope that its mission doesn't suffer the same fate as a satellite Facebook planned to use to beam internet connectivity to Africa. The PTS launch is planned for around the middle of next year -- around the time the European Union will abolish roaming charges for mobile subscribers. So if you're traveling to the moon next summer, let Vodafone know, and perhaps they will include your data traffic in the new roam-like-at-home rules, too.